With the F2 key you can rename any reading found by SpeedFan. On the configuration dialog you can see the hardware monitor chips that were found, where they are located and sample readings. SpeedFan knows about a lot of different digital sensors and system bus. If you happen to see an unusually high temperature on this dialog, perhaps it is simply a disconnected sensor: something that the hardware monitor chip can monitor, but that the motherboard manufacturer didn't use. This section is extremely powerful. Here you can fine tune your hardware. You can fix wrong temperature readings if you discover that an offset is needed because the manufacturer put the actual sensor slightly away from the monitored chip. You can even fix reported fan speeds, if they are, for example, twice the real value. The most important options here allow you to enable software fan speed control. By setting the remember it option you can tell SpeedFan to set that option whenever it starts and whenever your system resumes from standby. S.M.A.R.T. (or SMART) is a technology that allows the end user query the hard drive about its health and, usually, performances. SpeedFan can query those info for you. SMART reports, for example, if the hard disk has been used for too much time (thus reaching its expected end of life), or if it took too many attempts to start spinning, or even if too many read errors occurred. You might have a look at the "What is S.M.A.R.T. and how can we use it to avoid data disaster?" article. 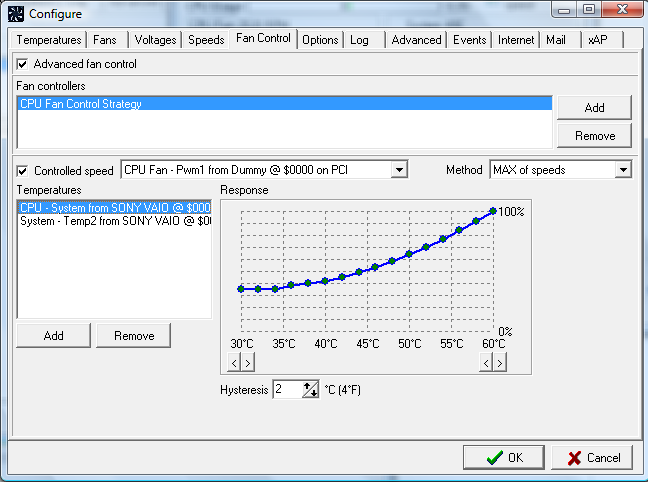 Fan speeds can be controlled by means of custom response curves. Different temperatures can have different response curves and multiple temperatures can control each fan speed.